Defence Minister Nosiviwe Mapisa-Nqakula today inaugurated a day to honour South Africa’s National Defence Force as well as soldiers of times past. 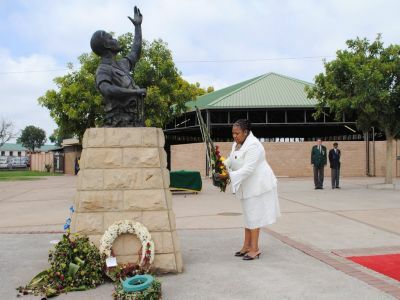 She linked the day to the disaster that saw the troopship SS Mendi sink with the loss of more than 600 soldiers and sailors some 97 years ago and began the new Armed Forces Day by laying a wreath at the SS Mendi Memorial in the Gamothakga Resort, Atteridgeville, Pretoria. The ceremony was attended by a large contingent of general and staff officers, including Chief of the South African Defence Force (SANDF) General Solly Shoke, Lieutenant General Vusi Masondo, Chief of the Army and Lieutenant General Zakes Msimang, Chief of the Air Force, among others. The organisers invited the hosts of the memorial, the South African Legion of Military Veterans, represented by National President Godfrey Giles and Atteridgeville Branch Chairman Abel Sefolosha. The SA Legion and the Pretoria Monuments Council last memorial to the heroes of the SS Mendi took place on Sunday, February 17, 2013. It had been announced President Jacob Zuma would lay the wreath but he was unable to attend and the Defence Minister stood in for him. The main parade was held at the Lucas “Masterpieces” Moripe Stadium, also in Atteridgeville. The parade, made up of all four arms-of-service of the SANDF comprised an “amended brigade” of some 1 200 soldiers, airmen, sailors and medics. The 10 companies included a combined colour party and the home crowd clapped and cheered as soldiers marched onto the field. It had earlier been hoped to hold a “capability demonstration”, including armoured vehicles and cannon, but media were told the heavy vehicles might damage the sprinkler system under the pitch and the home team was expected to play the next day (Saturday). The minister received a 19-gun salute fired by the Transvaalse Staats Artillerie, a reserve force unit which has links to one of the oldest units in the country, which was originally part of the armed forces of the old Transvaal Republic. The unit, known as the TSA, exists as a museum in Pretoria. Following the scripture reading and prayer by the chaplain, Rear Admiral M.S. Hlongwane, Minister Mapisa-Nqakula; and generals Shoke and Masondo inspected the brigade. Two Oryx helicopters performed a flypast as a salute to the minister, flying the national and SANDF flags. The colour party, bearing flags of local units of the Army, Air Force, Navy and the Military Health Service then led the parade in a march past which was well received by the crowd. The march past was followed by an air display featuring Oryx helicopters, Cessna C-208 Caravans, Pilatus PC-7 Astra trainers and a two-ship C-130 Hercules flypast. A four-ship combined BAE Hawk 120 and SAAB Gripen C formation shot overhead, all to the delight of the crowd. Mapisa-Nqakula praised the work of the SANDF in rescuing more than 400 people in recent flooding in Limpopo and Mpumalanga provinces, as well as in neighbouring Mozambique. She also had praise for the SANDF’s border protection work and its peacekeeping operations in Democratic Republic of Congo (DRC), Central African Republic and Sudan.